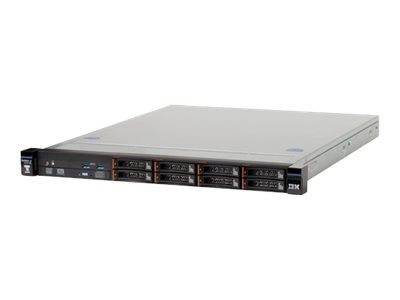 The IBM System x3250 M5 single-socket 1U rack server is designed for small businesses and first-time server buyers looking for a solution to improve business efficiency. It delivers several innovative IBM features in a compact 1U form factor at a competitive price. The IBM System x3250 M5 provides next-generation performance in an innovative and compact design with flexible configuration options, built-in security, and systems management capabilities. It leverages the next-generation Intel Xeon processor E3-1200 v3 product family technology. Power-on password, administrator's password, and TPM. 4GB (1x4GB) 1600MHz, expandable up to 32GB. There are four DIMM slots. One contains a removable 4GB module; the others are available. Support for Unbuffered (UDIMM) modules only. Up to four integrated Gigabit Ethernet 1000BASE-T RJ-45 ports with the onboard BCM5719 controller. NOTE: Two ports are enabled, and an additional two ports require the optional software FoD upgrade to enable them. C100 storage controller, SATA, supports RAID 0/1/10. NOTE: Optional upgrade to RAID 5 is available for the C100.